With advancement in technology, new cameras hit the market every now and them. All these cameras basically aim at capturing photographs that are very close to the person or thing that is being photographed. However metal prints that are the latest advancement in photography give a different touch your digital photographs that even your camera cannot produce. Metal prints are a real stunner when you compare a paper photograph with a metal print photo. The vibrant, colourful and glowing effect it brings on the final photograph is unmatched to the photo you get from any camera. This new technology is a boon for photographers who need a fresh, unique and glowing product. Metal Prints have many features and benefits attached to it and hence it is not surprising to find many professional photographers (not individual camera owners) considering metal prints as their new product offering. Metal prints on photographs do not imply the use of actual metal surfaces but the process is actually a dye-sublimation technique. Dye-sublimation inks are applied on a sheet of transfer paper which is then positioned on a metal (aluminium) panel that is coated with a specialized polymer. Heat and pressure of around 400° F is applied, which makes the ink elements to sublimate from solid elements to gas and then bond with the polymer on the aluminium panel. This entire process involved in metal prints, makes the final metal print photo to be very durable, colourful along with being extremely vibrant. Metal prints that are produced in a majority of labs use dye-sublimation method from ChromaLuxe. Every lab is provided with necessary information and process details about creating polymer coated aluminium panels all by themselves. However every lab alters the technique a bit, which is the main reason for some slight change in the look of the final product. One can easily spot these slight finish changes after ordering metal print photos from different labs. This is the best way to pick a lab that fits the bill. 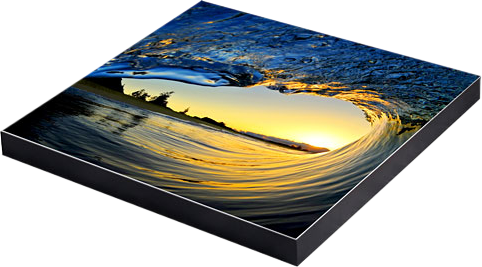 Metal prints unlike your paper photos are rigid, durable and water proof. Hence they can be hanged at any part of your house without fearing of it getting damaged by moisture or water. The hard polymer surface on metal prints makes them scratch-resistant. These metal print photos are intended for interiors (away from direct sunlight). However, if you do need a metal print to keep at the outdoors then choose a place that is away from the direct rays of the sun. Metal prints not only look beautiful but also enhance the décor of your home with appropriate lighting and home settings. Metal print photographs can be easily maintained by dry cleaning them with a clean dry cloth. Their durability and rigidity allows them to easily last for about 50 years. Good maintenance can help you preserve your favourite photograph for over 50 years and that too very comfortably. So many great features and benefits of metal prints are missing in paper photographs and hence they clearly have a greater edge. A beautiful technique for photographers to showcase and enhance their artistry, this eye-catching technology is here to stay and capture the interest of the crowd. © 2019 Metal Prints. All Right Reserved.